* Correction: Bob unintentionally exaggerated Clinton's willingness to support the PBA ban. See the full correction at the end of this show summary. * Christian Leader Koukl Defends Candidate Giuliani: Stu Epperson moderates the debate between Bob Enyart and STR.org's Greg Koukl on Stu's syndicated TruthTalkLive.com talk show. In the debate, Koukl defends Rudi Giuliani, an aggressively pro-abortion, pro-homosexual, anti-Christian worldview candidate, as acceptable to Christian voters. Koukl denies that Giuliani is a mass murderer and denied the parallel between Koukl's own position and that of the Herodians of the New Testament. To start the debate, Bob asked Greg, "What if Rudi Giuliani is the Republican nominee, should Christians support someone like Rudi Giuliani?" Greg spent the whole show answering that question in the affirmative, stipulating only that his answer applies if two candidates in the running are Rudi and a Democrat candidate like Hillary Clinton. 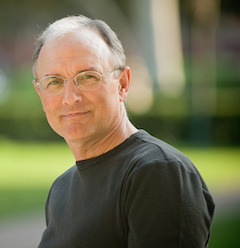 Bob characterized Greg's position as moral relativism. * Bob's Notes Against Christian Support for Giuliani: Christians should not support mass murderers. Rudi Giuliani is a mass murderer who as a governing official and candidate promotes child killing through public hospitals, tax funding, police enforcement, etc. Moral relativist Christians would oppose a candidate who was caught embezzling funds (not because it violates God's command, Do not steal, but because it is politically-incorrect). And while they'd not support a Republican caught embezzling, they support Republican candidates who brag of their support for killing children. Like Rudi Giuliani, Herod was personally sexually immoral and murderous. Greg Koukl's moral relativism would defend supporting Herod. But John the Baptist, instead of joining the Herodians, rebuked Herod, and for his courage, this wicked ruler beheaded the man whom Jesus described as the greatest born to women (Mat. 11:11). But how would Jesus describe Koukl? Greg's moral relativism might have led him to campaign for Herod (as he does for Giuliani), and instead of persecution, Herod might have hired Koukl as an apologist for his murderous reign and his hopes for the continued support of Ceasar after Antipas built Tiberias (Koukl: yes, Herod murdered John the Baptist, but I would still campaign for him to rule). Greg Koukl is imitating the pragmatic religious leaders, the Herodians. Mark 3:5-6 [Jesus saw] the hardness of their hearts, [and] the Herodians [plotted] against Him, how they might destroy Him. Romans 3:8 mentions "do[ing] evil that good may come of it" (Romans 3:8), Paul considered it slander to be accused of something Christians now embrace, doing evil, that good may come of it. Giuliani is not only radically pro-abortion, but for years even supported the especially horrific partial-birth abortion. Giuliani is radically pro-homosexual, and would ban all handguns. New York Daily News, March 8, 2004 Rudy Giuliani came out yesterday against President Bush's call for a ban on gay marriage. ... "I certainly wouldn't support [a ban] at this time," added Giuliani, who lived with a gay Manhattan couple when he moved out of Gracie Mansion during his nasty divorce. Secular humanists who support Giuliani: Sean Hannity, Hugh Hewitt, Michael Medved, etc. Publicans: tax collectors, public building contractors, and military suppliers. The New Testament condemns the publicans, so Christians now sell their souls for the Re-publicans. The theme of much of the Old Testament, from the books of Moses, through Joshua & Judges, through the prophets, is that God's people did not trust Him, nor obey Him, not with national politics, and instead made alliances with wicked leaders, and so God abandoned them to their own destruction. Carl: where does Koukl draw the line? ... at 100,000,000? What line must be crossed that will turn Christians from supporting wickedness and back to God? Dave: Koukl thinks that Scalia, Thomas, Roberts and Alito would fight for the Personhood of a child. I guess he did not read the Supreme Court decision of Gonzales v. Carhart. John quotes Reagan: "Politics I supposed to be the second-oldest profession. I have come to realize that it bears a very close resemblance to the first." Gus B: Mr. Koukl says Giuliani will appoint justices like Thomas and Scalia. Pastor Enyart points out these two do not believe in personhood... to which Koukl says, "Pro-Life Justices are not relevant to this topic." Andrew: To support the better of two murderers is relative. ... Webster should post your photograph next to "moral relativist." * Give your opinion at TruthTalkLive.com. Today's Resource: Have you seen the Government Department at our KGOV Store? You can view BOTH of our powerhouse Focus on the Strategy DVDs for only $22.99! Also, we are featuring Bruce Shortt's vitally-important book, The Harsh Truth about Public Schools. And also, check out the classic God's Criminal Justice System seminar, God and the Death Penalty, Bob on Drugs and the Live from Las Vegas DVDs! Hi STR! Dr. Richard Holland of Liberty University wrote "God, Time and the Incarnation" surveying the leading Christian theologians on this topic and concluded that specifically *with respect to the Incarnation* the church has never openly defended its claim that God is utterly unchangeable. In my debate with theologian Dr. James White I took that insight and five times asked him about whether God the Son took upon Himself a human nature. (There's a 2-min YouTube showing those excerpts.) So far beyond the old/new covenant issue, reaching right into the heart of the Trinity, God the Son became a Man. God is unchanging in His fierce commitment to righteousness (i.e., His holiness), but because He is the Living God, He changes in immeasurable ways, including when the Son became the Son of Man. * For Bob's Many Other Fun and Educational Debates: See kgov.com/debates for our creation/evolution sparring with Lawrence Krauss, Eugenie Scott, AronRa, Michael Shermer (and spats with Jack Horner, PZ Myers, Phil Plait, & Jerry Coyne), and our exposing the liberal in the conservative with Ann Coulter, Dan Caplis, Greg Koukl (of course), Tom Tancredo, AFA's Bryan Fischer, AUL's Paul Linton, CWA's Robert Knight, National RTL's Board, NRTL's Political Director, Focus on the Family's Washington State Affiliate; and exposing the wickedness in the liberal with Barry Lynn and libertarian candidates; and opposing the national sales tax with Ken Hoagland and Neal Boortz; and debating sexual immorality with homosexual activists Wayne Besen and Gregory Flood; and defending the death penalty on Court TV; and theology with a Seventh Day Adventist, drinking alcohol with a Church of Christ minister; and whether or not God is inexhaustibly and eternally creative with Dr. James White, and King James Onlyism with one of their leading advocates; and finally, abortion with Ilana Goldman, Peggy Loonan, and Boulder, Colorado's infamous late-term abortionist Warren Hern.